Curling irons have been around since the invention of electricity. But in the last few decades, the hair curling industry has expanded to include a slew of different options such as wands. 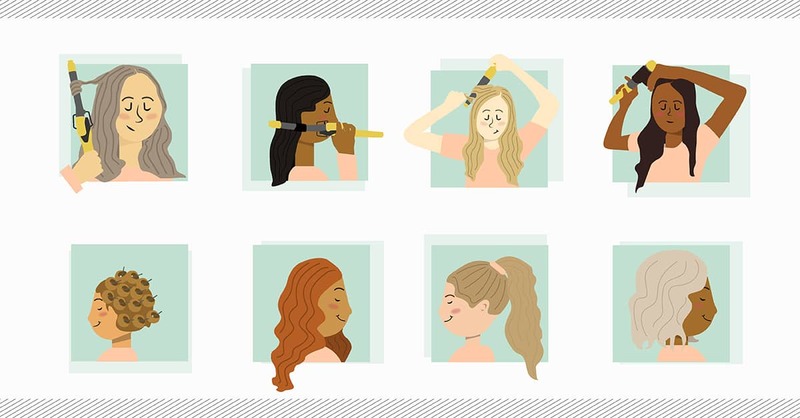 If you’re not sure how to use a wand to achieve the curl you want, read on for buying and styling tips. Classic curling irons include a clamp to create polished ringlets (a la Shirley Temple). The ends of hair sections are clamped and curled first with the barrel facing up, which results in a put-together hairstyle perfect for events or work. Curling wands don’t include a clip, but they can be used to create more versatile styles and natural curls and waves by wrapping hair around the barrel. Different size barrels create different styles. Look for small barrels (3/4 or 1 inch) to create tight, defined curls; medium barrels (1.25 or 1.5 inch) to create loose curls; or large barrels (1.75 or 2 inch) for subtle, relaxed waves. Choose curling wands made from ceramic or tourmaline, which heat evenly for less styling time and reduced damage. Have an old curling iron? Unscrew the clamp to create a makeshift wand. Wands also come in cone-shape versions. The tapered style is larger at the base and smaller at the tip, allowing for different sized curls. The smaller end creates more precise curls while the larger base gives looser waves near the roots. Bubble wands have also gained in popularity because they make beachy waves easier. The textured wand, which looks like a bunch of spheres glued together, helps guide hair into creases for perfect waves. Unless your bathroom resembles a beauty salon, it’s unnecessary to buy every wand. The 1-inch barrel is universal and can achieve a range of styles. For looser curls, just section off larger pieces of hair. Curling wands typically get hotter than irons and can damage hair if not placed on the correct setting. If your hair is fine or fragile, choose the lowest heat setting (below 200 degrees). Bump up the heat if you have thick hair, and pay attention to the way your hair reacts. If you notice damage, adjust the heat accordingly. Though some wands can exceed 400 degrees, try to avoid such high heat. To reduce damage, hold the wand in place for only a few seconds—10 at most. The latest tools don’t take much time to create the perfect curl. Since wands don’t have a clamp to hold the hair in place, you’ll need to hold the ends of your hair close to the barrel. To prevent burns, invest in a heat glove to protect your hand while curling. Like all beauty tools, curling wands need to be cleaned periodically. To prevent product buildup, wipe the wand down with a damp cloth when it’s cool. Excess residue can prevent your wand from heating accurately. If you need to pack it immediately after using it, wrap it up in a cooling bag. To prevent hair damage, always apply a heat protectant before styling. If you’re a regular hair wand user, add serums and hair treatments to your routine to maintain shine and bounce. Dull, dry hair won’t hold curls as well as healthy, nourished hair.